German online-portal wegweiser-freiwilligenarbeit.com and South African NGO CACH (Campaign Against Canned Hunting) alert people that want to contribute to the conservation of endangered species in Southern Africa not to participate in lion breeding projects. Animal farms that advertise caring for supposedly orphaned big cat cubs are frequently part of the hunting industry. A legal analysis of the commoditisation and exploitation of lions in the commercial lion indsutry of South Africa. What are the ethical issues surrounding canned hunting? I am a grade eleven student from Adelaide, Australia and for this years school curriculum I am required to research a topic of my own choice and create a 2000 word outcome using several different sources. The topic I have chosen is on the ethical issues surrounding canned hunting as I am extremely passionate about this topic. How can there be meaningful dialogue when only the Hunters Association and Predator Breeders Association are the only organisations invited to meet with Government. Under the Chairmanship of CACH UK Leader, David Nash, the Eurogroup members of CACH met in Brussels in order to stratagise a way forward to stop lion farming and canned hunting. Can captive hunts actually save animals? The practice of hunting wild animals for food is largely considered a cruel act among animal lovers, but there is perhaps another form of hunting that is equally – if not more – cruel that has recently become the subject of many controversial debates: captive hunts. Please read this very good article in Projects Abroad by Samantha Evans and educate yourself, before you too are are sorry you supported such an industry. The world’s biggest international carrier joins South African Airways in banning transport of trophies of exotic wildlife such as elephants and rhinos. Emirates Airlines will stop carrying hunting trophies of elephants, rhinos, lions, or tigers on its planes, the company announced this week. The decision is meant as a step “to eliminate illegal trade and transportation of hunting trophies worldwide and save wildlife heritage,” according to a statement from Emirates. New York leads by introducing a ban on importation of African Species. New York State Senator Tony Avella has introduced a Bill to ban the importation, possession, sale or transportation of five African species to New York – lions, leopards, elephants, and black and white rhinos. If successful, the Bill will prohibit transport through New York – a major airport and seaport route of entry in to the USA. We find allies in many places, and each one of them is willing to do what they can. 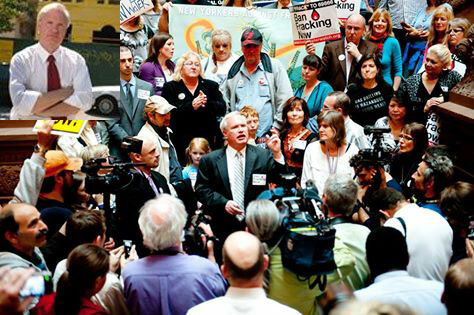 Tony Avella’s FB page is https://www.facebook.com/tonyavellaforNewYork - please take a few minutes to thank him. The Australian Government is taking action to protect African lions from what Environment Minister Greg Hunt called “the barbaric practice of canned hunting” by banning the import and export of trophies made from lions. The announcement was made at the Global March for Lions in Melbourne earlier this month. The African lion, Panthera leo, is classed as Vulnerable to extinction by the authoritative IUCN Red List of Threatened Species. 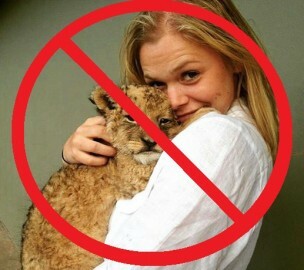 Canned hunting is not protecting wild lions! Time is running out for the African Lion, the king of the jungle is fast heading towards extinction. If we are to protect their future, there can be no justification for the continued hunting of wild lions and the cruel canned hunting business should be shut down for good. 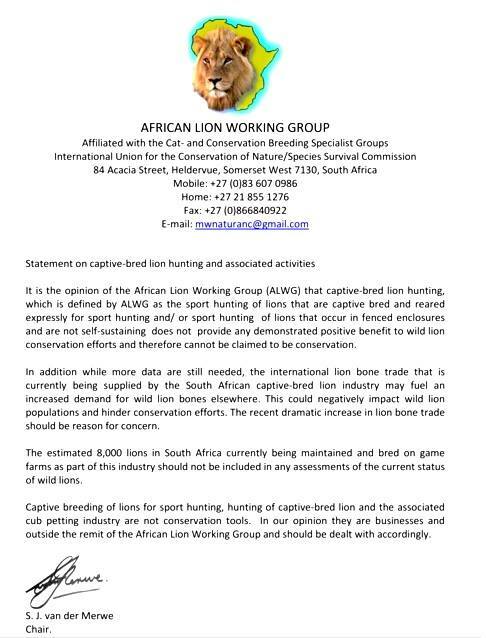 The canned hunting operators claim they are protecting the future of wild lions by breeding lions for trophy hunters, however this could not be further from the truth. Most trophy hunters are only interested in taking the skin or the head of the lion they have shot, leaving the most valuable part of the carcass, which are the bones. South Africa’s lion hunting industry has little to do with conservation and everything to do with profit but it seems only foreign governments care. South African farmers are using cattle-rustling routes in the Northern Cape to smuggle wild lions and other predators out of Botswana to supply a growing demand for lion-bone potions in the Far EastConservationists said the illicit trade by organised cartels was adding to the pressures that could see the extinction of big cats in the wild within 10 to 12 years. They denounced Environment Minister Edna Molewa’s response to parliamentary questions that a moratorium on lion-bone exports from South Africa was unnecessary because they do not pose a threat to the survival of the species in the wild. Dereck Joubert, leader of National Geographic’s Big Cats Initiative, said the lion-bone market was adding to the “emergency situation” facing Africa’s wild lions — the population has crashed from about 200 000 in the 1970s to less than 20 000 today. 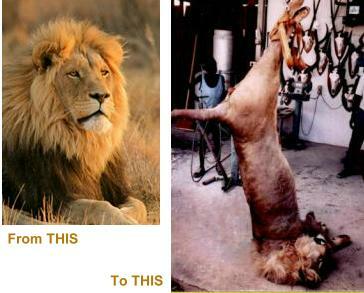 Watch 60 Minutes on CBS news in USA to see the dramatic exposure of Lion Parks in South Africa that pose as sanctuaries. Their hunting dollars pervert conservation policies in vulnerable third world countries, instigating and perpetuating evils such as captive lion breeding and canned hunting.